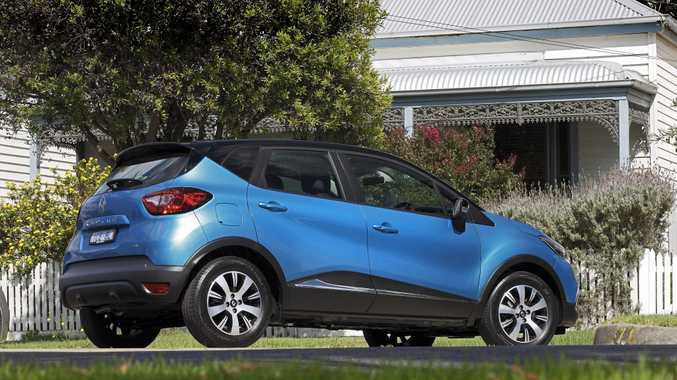 THE Renault Captur, which has delivered some remarkable figures around the world for the French motoring house, is now on sale in Australia. 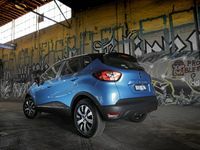 The crossover, hoping to make its presence felt in the crowded and growing small SUV market, is a delightful stylish little number and a pillar model for Renault with the Australian division looking for a 20% growth this year on 2014's impressive sales figures. 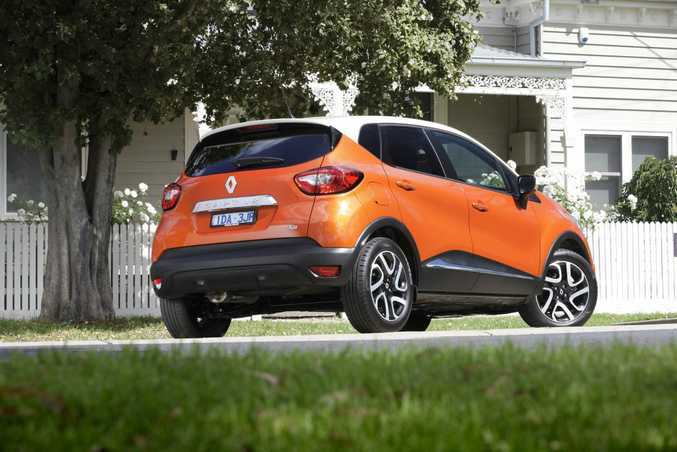 The Captur is based on the B-platform of the Clio, its well-liked and successful stablemate, and brings to the market a considered blend of technologically-savvy engines, trendy design options and real-world practicality. 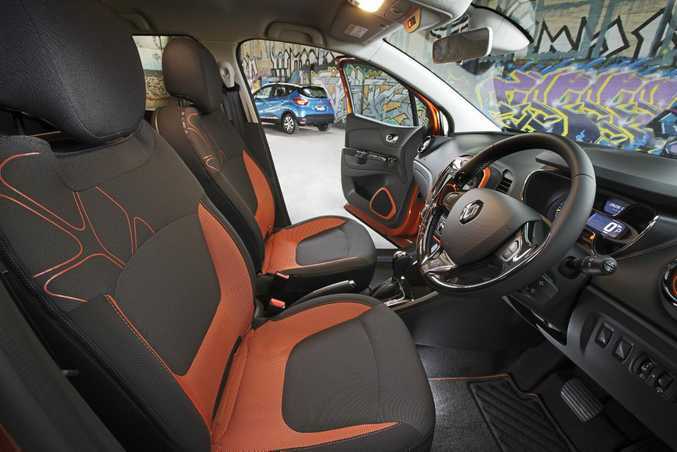 The interior of the Captur matches the outside for style, funkiness and customisation. Buyers can choose from orange, chrome, blue or green for the centre console, air vent surrounds and loudspeakers as well as patterns for the seat covers and highlights for the steering wheel and upholstery which certainly adds to the appeal. The console itself is nicely set out with switchgear of varying quality and some hard plastics as you would expect at this price point. The instrument cluster has the look of an oversized pair of sunglasses, classy ones at that, with an unmissable digital speedo separating the lenses. The Captur feels pretty spacious with a fair bit of leg and headroom for those in the front, a little less for backseat passengers though. That disadvantage is echoed in the seat quality with those in the back having to make do with a harder, less cushioned surface. The rear seat does slide forward and aft though depending on how much room you need in the boot, the latter also benefiting from a removable multi-position floor. Our launch circuit saw us try both the 0.9-litre three-cylinder manual version as well as the slightly more robust 1.2-litre four-cylinder automatic. 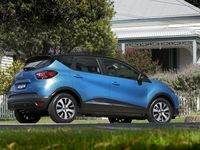 The eye-catching crossovers cut an impressive swathe through the Victorian countryside as we got to witness their prowess within the stop-start confines of the city, on fast-moving highways and on secondary country roads. While both models were hard to separate within the city, which let's face it is where most people will drive it, I was much more impressed with the three-cylinder's composure around the twisties and certainly up and down the hills. Renault has done well to make such a little engine appear so lively and capable and enjoyable to drive. With a higher driving position and adjustable steering it is easy to get comfortable and visibility all around the car is good. nice when you are carrying kids, sticks to the road well with good response on the throttle and sharp breaks. The steering is a bit vague and there is the occasional understeer but it delivers on what it promises. 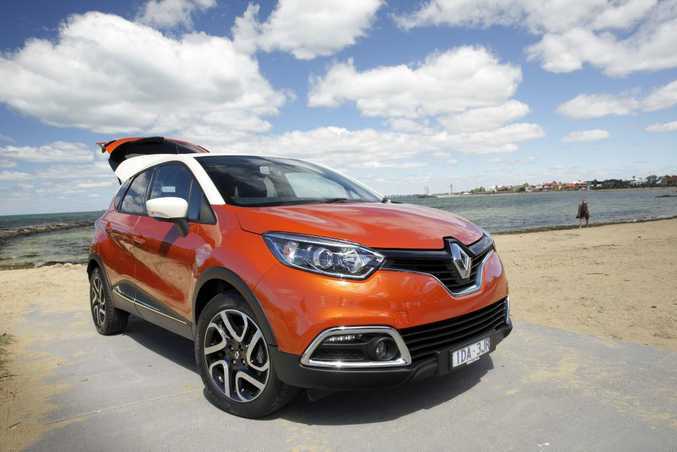 Renault has packed the Captur full of goodies with even the entry model getting a reversing camera and parking sensors, rain-sensing wipers, auto headlights, keyless entry and push-button start. There is a 17.7cm touch-screen media navigation system which can be upgraded to the R-Link enhanced system for $990 and a good audio system with Bluetooth capability, LED daytime running lights as well as both cruise and climate control. The top-spec Dynamique also adds a cornering function in the fog lights, washable and removable seat covers, 17-inch alloys and two-tone body colour. Safety features include six airbags, anti-lock brakes with brake assist and EBD, stability control, anti-slip control and hill start assist. Renault has used a number of clever technologies to keep fuel usage at a minimum including stop-start as standard, deceleration and braking energy recovery and downsized turbocharged engines to complement aerodynamic design, weight saving options and low resistant tyres. Official figures for the TCe 90 is 4.9 litres/100km with the TCe 120 at 5.4L/100km. Aside from a funky design and excellent safety features, the Captur has a range of other well-thought out elements which are sure to impress. The removable washable seat covers for one will be a boon for anyone with small children while the boot with its two-position floor can accommodate family luggage as well as the shopping without losing the eggs. Colourful string seat pockets may be on-trend but are far from practical and neither are the cup holders which would battle to contain a regular takeaway coffee cup or a bottle of water. With its distinctive proportions, flowing lines and two-tone body colour the Captur crossover both captures and keeps the interest. Muscular wheel arches and large wheels offer up a sporty feel. The exterior can also be personalised with a two-tone finish for the roof; black, orange, ivory or chrome inserts for the grille surround, fog light housings, low protection strips on the door and tailgate trim strip with the option of orange, ivory or black for the wheels and decorative graphics for the bonnet, roof and tailgate. 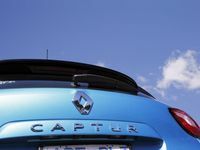 Renault says the Captur has appeal across age ranges and will find interest among young professionals, small families and older couples without kids at home. It certainly has the goods to impress with a funky exterior combining well with interior comforts. But there is work to do in a tough segment. Details: Five-door front-wheel drive small SUV. Engines: 0.9-litre three-cylinder turbo-petrol generating maximum power of 66kW @ 5250rpm and peak torque of 135Nm @ 2500rpm. 1.2-litre four-cylinder turbo-petrol generating maximum power of 88kW @ 4900rpm and 190Nm @ 2000rpm. Transmissions: Five-speed manual and six-speed automatic. Consumption: 4.9 litres/100km (m), 5.4L/100km (a). What we liked: Funky exterior, spacious interior, great inclusions, clever features. What we'd like to see: Auto in three-cylinder, a more involved drive for the 1.2-litre auto, larger cup holders. Warranty and servicing: Five-year unlimited kilometre warranty and five years roadside. Service intervals are 12 months/15,000km with the first three services capped at $299 each.